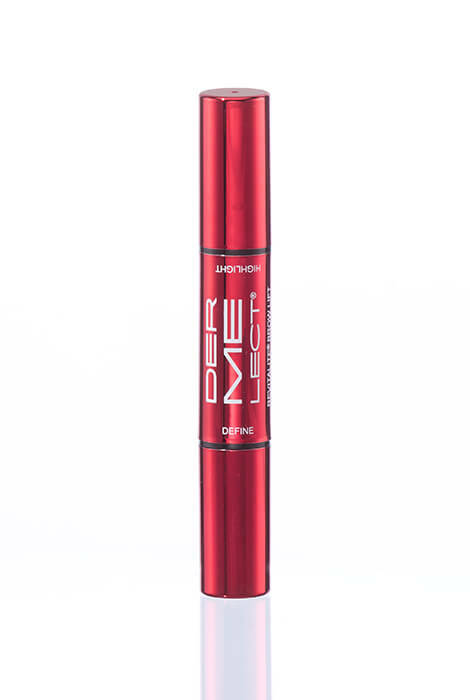 Create the look of youthful, lifted brows with this Dermelect® Revitalite® Brow Lift pencil. Get eye-opening results with the two-step defining and highlighting pencil. 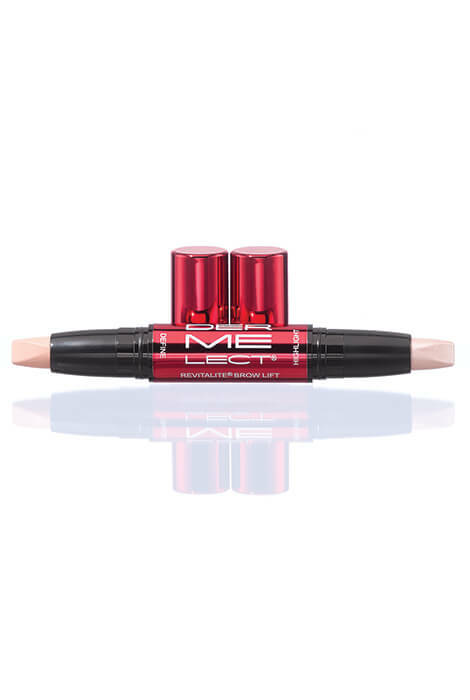 The eyebrow lift pencil perfectly accentuates arches to make eyes pop, giving the brow area a 'lifted' look. Instantly illuminate and achieve a youthful, eye-opening look, thanks to micronized pigments that perfectly conceal and blur wrinkles and fine lines. Eyes appear brighter, beautifully wide and more expressive. Designed with dual finishes, matte to define and pearl to highlight. Can also be used around the inner and outer corners of the eyes for an instant brightening effect. Retractable pencil, no sharpener required. Perfect for all skin tones and types. DEFINE: Apply the DEFINE (matte) side above the brow arch and lightly tap, dab & blend with finger tips. HIGHLIGHT: Apply the HIGHLIGHT (pearl) side below the brow and lightly tap, dab & blend with finger tips. BEAUTY TIP: Revitalite Brow Lift can also be used around the inner and outer corners of the eyes for an instant brightening effect. PEARL (HIGHLIGHT) INGREDIENTS: MICA(CI 77019) ▪ ISOTRIDECYL ISONONANOATE ▪ DIISOSTEARYL MALATE ▪ PHENYL TRIMETHICONE ▪ OLEYL ALCOHOL ▪ TITANIUM DIOXIDE(CI 77891) ▪ CERESIN ▪ EUPHORBIA CERIFERA (CANDELILLA) WAX ▪ DIPENTAERYTHRITYL HEXAHYDROXYSTEARATE/HEXASTEARATE/HEXAROSINATE ▪ MICROCRYSTALLINE WAX ▪ METHYL METHACRYLATE CROSSPOLYMER ▪ IRON OXIDES(CI 77491) ▪ PHENOXYETHANOL ▪ TOCOPHERYL ACETATE ▪ SIMMONDSIA CHINENSIS (JOJOBA) SEED OIL ▪ CARMINE(CI 75470) ▪ CERAMIDES ▪ PALMITOYL HEXAPEPTIDE-12. MATTE (DEFINE) INGREDIENTS: MICA(CI 77019) ▪ TITANIUM DIOXIDE(CI 77891) ▪ DIISOSTEARYL MALATE ▪ OCTYLDODECANOL ▪ OLEYL ALCOHOL ▪ CERESIN ▪ EUPHORBIA CERIFERA (CANDELILLA) WAX ▪ DIPENTAERYTHRITYL HEXAHYDROXYSTEARATE/HEXASTEARATE/HEXAROSINATE ▪ LANOLIN ▪ COPERNICIA CERIFERA (CARNAUBA) WAX ▪ MICROCRYSTALLINE WAX ▪ IRON OXIDES(CI 77492) ▪ IRON OXIDES(CI 77491) ▪ PHENOXYETHANOL ▪ TOCOPHERYL ACETATE ▪ IRON OXIDES(CI 77499) ▪ CERAMIDES ▪ PALMITOYL HEXAPEPTIDE-12.